It's been awhile since I used banners in my cards! This week's Global Design Project challenge was the perfect reason for me to dust off my Banner Triple Punch and also play with some NEW designer series paper! This week the Global Design Project challenge is a sketch challenge. You can check out the details by clicking on the GDP sketch below. Check out all those banners! 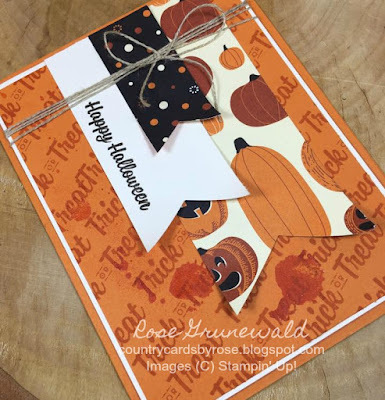 I knew when I saw them I wanted to use some of my gorgeous new Spooky Night Designer Series Paper. I just got some brand new stamps from the Holiday Catalog, so of course I wanted to use my new stuff right away and give you a sneak peek! Isn't that paper so pretty? I used the Happy Halloween and Trick or Treat sentiments from the coordinating Spooky Cat stamp set. Your sentiments can be used to make a pretty background by repeated stamping across your layer. 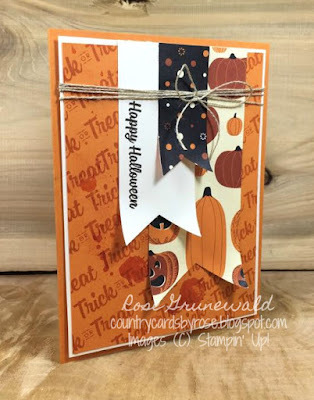 I used the "Trick or Treat" sentiment this way in Pumpkin Pie ink over the Pumpkin Pie layer. I also tried a new technique - see those subtle splashes on the card front? I used my aqua painter and clear embossing powder to get that look. Just drop some water form your aqua painter, cover in clear embossing powder, and set with your heat tool. I hope I've inspired you with this sneak peek of a new set and new DSP from the Holiday catalog! 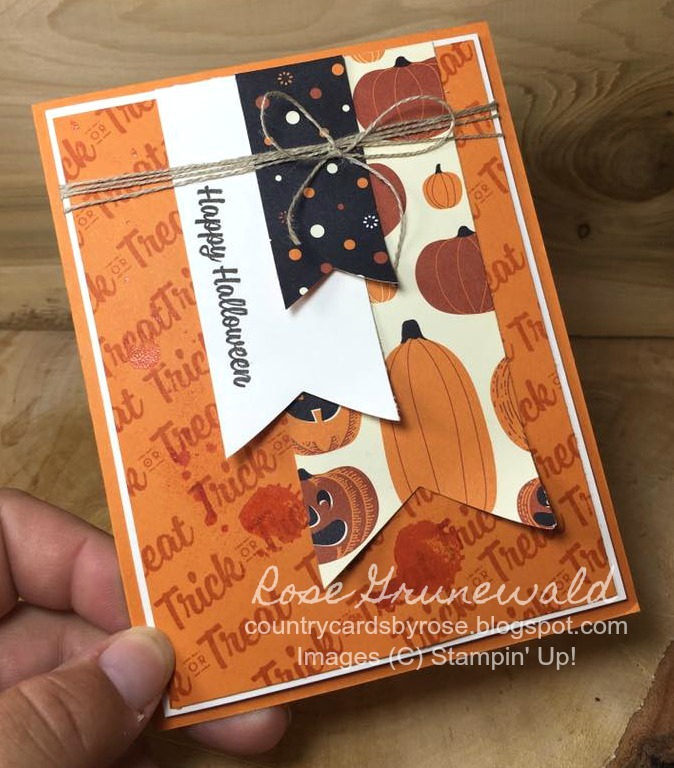 If you don't have a Stampin' Up! demonstrator, I would be so thrilled to earn your business! I love inspiring you with my projects, and all of my customers get an invitation to my private Facebook VIP page where I share exclusive projects with you, we play games, and you can win prizes! Remember to use my July hostess code J3KE9KT6 to get a special gift from me :).